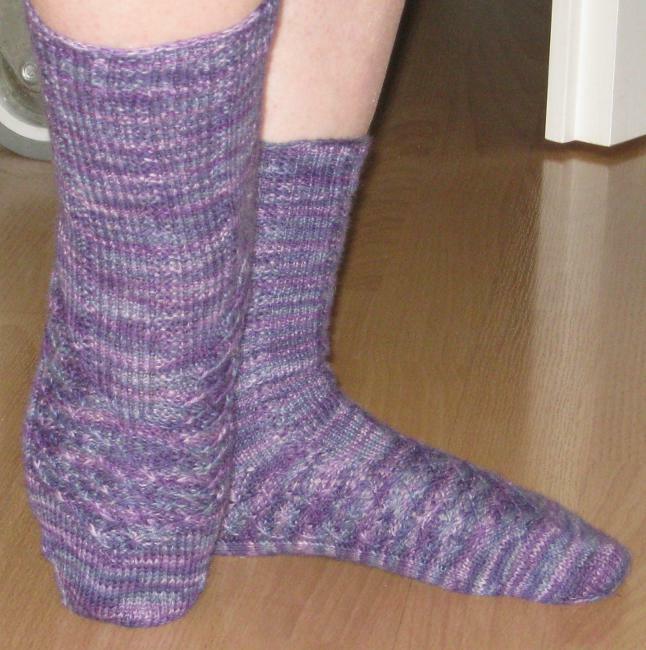 Als ich diese Socken in der aktuellen Knitty sah war sofort klar, daß ich sie stricken wollte. Daß die Designerin eine langjährige Internetbekannte war, war nun kein Nachteil. When I saw these socks in the last Knitty I knew instantly that I wanted to knit them. That the designer is someone I’ve been knowing for quite some time over the web was another plus. The yarn was „Step“ from Austerman. It gives a gauge that is a bit tighter than my normal sock gage and so I was able to match the stitches of the pattern (with needle size 1,75mm), but no chance for the rows. My stitches are higher than what they are supposed to be. Leider kommt das Muster in dem Garn nicht so schön raus, weil es zu unruhig ist. Aber das Stricken hat Spaß gemacht. Weniger wegen dem Garn, denn das spleißt sich doch leicht auf. Ich habe es mal eingetauscht, kaufen werde ich es sicher nie. The pattern doesn’t come out to well because the yarn has to much contrast between the shades. But it was a lot of fun knitting the sock. This was not due to the yarn, because that likes to split. I got it via a swap and I know that I will never buy it. Aber da das Muster sehr logisch aufgebaut ist und auch die Konstruktion größtenteils leicht zu begreifen, kann zumindest er erfahrene Sockenstricker gut damit leben. Für Anfänger würde ich das Muster jetzt nicht unbedingt empfehlen. Angefangen hatte ich übrigens mit einem Nadelspiel, ich habe dann aber auf zwei Rundnadeln gewechselt, weil das wegen des Musters doch einfacher war. Den detaillierten Verlaufsbericht mit mehr Photos gibt es wie immer bei Ravelry. But since the pattern is very logical and also the construction is not really difficult to understand any experienced sock knitter can make his or her way. If you never made socks I would not recommend the pattern. I had started knitting on dpns, but with the pattern on the top of the foot knitting with two circular needles is easier. For the detailed report and more pics go to Ravelry. Dieser Eintrag wurde veröffentlicht in Socken und verschlagwortet mit Austermann, knitty, Maeva. Stefanie Bold, stebo von nowak. Permanenter Link zum Eintrag.